Today I'm taking part in the Coyote Moon blog tour. The book officially hits shelves tomorrow. As part of the blog tour, I'm giving away one copy of Coyote Moon donated by the publisher. The details and entry form can be found at the bottom of this page. The engaging narrative of Coyote Moon follows the journey of a female coyote as she hunts for prey at night. Gianferrari writes in the present tense in a style that is poetic at times. The precise language and word choice make for a thrilling read as the mother coyote creeps, charges and pounces in her quest to find food for her family. Ibatoulline's realistic illustrations use somber colors to give readers a sense of what it is like to hunt for food in the dark. One exciting spread shows the coyote leaping through the darkness with just one word "Pounce!" printed on the page. As the sun rises, the coyote is successful in catching a turkey to bring back to the den for her pups. The killing of the turkey is realistic, yet the author and illustrator are sensitive to the young audience. The turkey's tail feathers can be seen on the page alongside the face of the coyote and the sentence, "Now coyote's family will eat." Back matter provides readers with additional facts about coyotes and lists of books and websites for further reading. 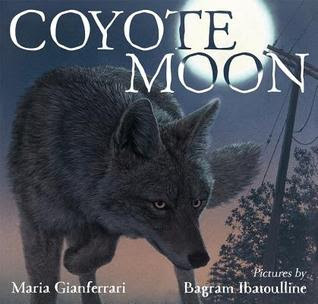 Read aloud Coyote Moon to elementary classes as part of a science unit on predators or food chains. The book would also make the perfect mentor text for students writing narratives or poems about natural science. Visit the publisher's site to preview pages from the book. Read the Reading for Research blog post and interview with Maria Gianferrari and her editor, Emily Feinberg. Be sure to visit other stops on the blog tour this week. Click here for the entry form or fill out the form below. Thanks for featuring Coyote Moon on The Nonfiction Detectives, Cathy!! I really appreciate it :)!! I'm glad Bagram doesn't have to illustrate me hunting in the dark for food. :) When I try to sneak a midnight snack from the kitchen I always stub my toe, then wish I had just waited until breakfast! Yay! I got my copy of Coyote Moon today! It is so gorgeous and the text is just simply beautiful. And Maria, I love the back matter, too! What a fantastic book. Thanks so much, Deb!!! So kind of you to say--I really appreciate it! !